Painting is an affordable and relatively easy way to transform your décor, but stray paint marks on your trims, floors and ceilings detract from the results of your hard work. Here are some common mistakes made during an interior painting project that you can avoid with proper preparation. Doing a little bit of prep work can save you a lot of headaches and cleanup in the end. Move heavy furniture to the center of the room and cover with plastic drop cloths to avoid drips and splatters. Wrap doorknobs with plastic and tape around the edges of trim. Remove cover plates from switches and outlets and protect switches with tape. If you’re painting the ceiling, you’ll need to protect hanging fixtures and cover up recessed lights. No one wants to run to the store mid-project covered in paint. Take measurements and estimate correctly. Typically, a bucket of paint covers 400 square feet, and then add extra to your estimate for touch-ups. It’s a good idea to get all your paint on the first trip because the color can differ slightly if it’s mixed at different times. Make sure you are using the right brush for your project. With latex paint, you’ll want to use a brush with synthetic bristles, while a natural-bristle brush works best for oil-based paints. Quality is also key to good application, so if you buy a good paint you should spend a bit extra for good brushes. BONUS TIP: Don’t dunk your paintbrush completely into the can. Just dip the brush in a third of the way to avoid dripping and wasting paint. Taping ensures that you’ll have clean edges and a polished finish on your project. Make sure you seal the tape tightly around baseboards and windows to prevent the paint from bleeding underneath the tape. Remove tape before the paint dries completely because if you wait, the dried paint might peel off the wall during tape removal. If you paint your second coat too quickly, it could result in visible brush strokes or peeling paint, thus ruining all of your hard work. Your paint’s dry time should be listed on the paint can, but if you are unsure, a common rule of thumb is to wait 24 hours. 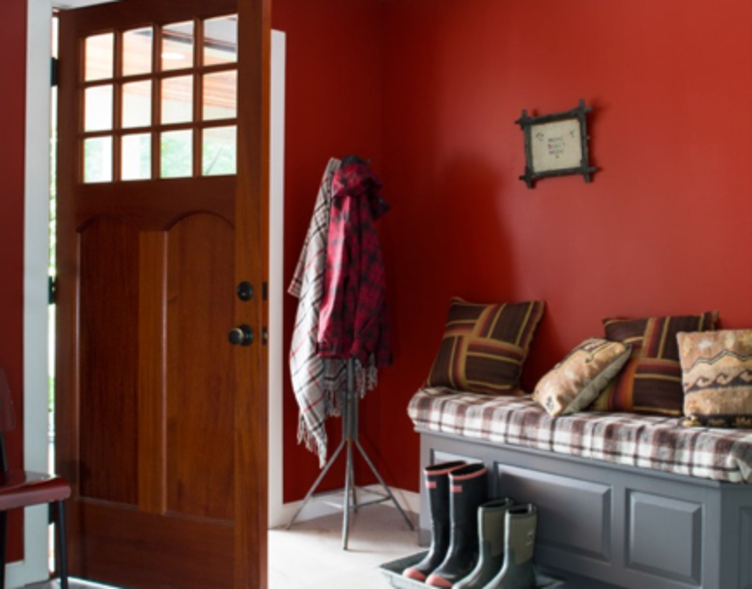 When you decide it’s time to brighten up your décor after a winter slumber, check out the variety of Benjamin Moore paints available at your local Rocky’s Ace Hardware Paint Studio.